The '''Shoutbox''' module provides an interface for users to quickly post messages that are viewable on any page an instance of the module is located. The shoutbox has multiple pages that users can parse through to see archived messages. After this limit is reached, the oldest message on the current page will be moved to the previous page to make room for the newest addition. This determines which users can post on the shoutbox. The default is "All". It is recommended that you change this to at least "Registered Users", otherwise you may see an influx of random posts from anonymous visitors on your shoutbox. This determines which users are able to delete posts on the shoutbox. By default, this list is clear, although the Site Owner and Administrators will be able to delete posts. Once the shoutbox is made to your satisfaction, you must place it on a page. Use the [Pages] tab and find the page(s) you want the shoutbox to appear on. Then, in the [[Layout Editor]], create a [[Container]] for your module. Finally, click the "Add Module" link and choose your shoutbox module from the list. 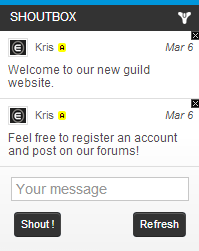 Users will now be able to view and interact with the shoutbox on the page(s) you placed it on. Posting is done through typing in the "Your message" text field and clicking "Shout!". Once you post, the shoutbox will automatically refresh on your end. Other users will have to refresh the page, post, or refresh the shoutbox to view it. For those with the appropriate privileges, moderation can be done by clicking the small "x" on the top right corner of any offending post.